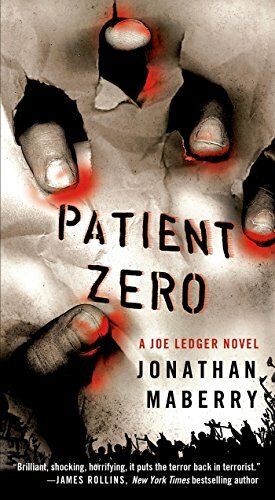 I posted my review of Patient Zero, by Jonathan Maberry. This is a book I received through LibraryThing's Early Reviewers program. It is a zombie book featuring Islamic millennialism. Update 2014/05/24: reposted the review here after a site architecture change inadvertently deleted it. Patient Zero combines two genres that I had not expected, geeky technological thriller and flesh-eating zombies. This ought to be a natural fit, because the readership of the two likely overlaps. However, I had not seen it done before. An unexpected element in this book is its treatment of Islamic terrorism. Maberry described his terrorists believably, and did not need to invent fairy tale mad scientists. In the world of books, the closest comparison is to Max Brooks' Zombie Survival Guide and World War Z. However, one ought also to look to the world of videogames, with Resident Evil and Left4Dead salient examples. The debt to George Romero is clear. However, among these works, Patient Zero stands out because it posits a believable motivation for those who unleash the zombie apocalypse. I found Maberry's terrorists quite believable. Their motivations ring true, even if their abilities do not. It is plausible that an evil mastermind could be born in Afghanistan with a unique knack for microbiology and genetic engineering. It is somewhat less plausible that if she were a woman she could acquire the education necessary to make use of her talents. No amount of talent can make up for poor laboratory technique, which is learned by apprenticeship. However, the part that is unbelievable is that you could find that many laboratory technicians in remote Pashtun-speaking villages. That being so, the religious fanaticism that underlies the biological experimentation does not suffer from these difficulties. While Patient Zero could not be considered a treatise on Islam, the basic beliefs of Islam, the Five Pillars, and the Six Articles, are presented accurately. Within this framework, the Islamic interpretation of El Mujahid and Amirah that makes the plot move is not only plausible, but precedented. The figure of El Mujahid is probably one of the most interesting in the book. There are two Islamic archetypes that he could fit into, the mujaddid or renewer, and al-Mahdi, the rightly guided one. Based on the phonetic similarity, El Mujahid could be intended to be the renewer of Islam that Muhammad predicted would come every one hundred years to invigorate the faithful. The difference could simply be a differing transliteration of the same Arabic word. However, the lengths to which El Mujahid is willing to go fit better with the Mahdi, who is permitted to interpret the Will of Allah directly, even abrogating previous suras of the Qur'an. This would be especially appropriate, since the aim of El Mujahid is to wipe the unbelievers off the face of the earth, and usher in a new era of peace, which is the mission of the Mahdi. However, he does not fit the rest of the archetype, because the Mahdi is preceded by both by al-Dajjal, the deceiver, and Isa bin Maryam, Jesus. Both of these figures are absent in Patient Zero. The technological and military facets of Patient Zero rise to the level of gadget pr0n. Fortunately for Joe Ledger, our protagonist, his mysterious superior has access to nearly every scientific instrument and weapon known to man, and some that probably are not. Maberry also makes use of his martial arts knowledge to enliven the combat scenes. Let us be honest, much of the fun of the book is in the ability of Joe Ledger to kill zombies in new and unusual ways. Patient Zero is much better than the average zombie work, because we get to see the process by which a competent and knowledgeable public safety agency learns to deal with the living dead. This process is incremental and tactically aware, although it is not technologically limited. The psychological aspect of the book is good as well. We get to see the deleterious effects not only of dealing with zombies, which is difficult enough, but the very real toll taken on anyone who kills another human being. Maberry does a better job portraying the very human reasons behind the fatal hesitation that kills many a minor character in zombie stories. This alone makes Patient Zero a good read. Many zombie works are poorly characterized, with little grasp of the human realities at play. The Resident Evil videogames are good(bad) examples of this. [don't ask about the execrable movies] Renowned for their terrible scripts, the Resident Evil games are actually very similar to Patient Zero in the premise of a bioweapon unleashed by wicked and power-hungry scientists. Where Patient Zero is better is in the more human responses of the characters, both good and bad. Resident Evil games often feature greed and cupidity as motivations, yet it is often unclear just what monetary or political benefit these evil masterminds will be gaining from the use of a biological weapon. In Patient Zero, the evil capitalist is just the tool of the far more sophisticated religious fanatics, who have a clear idea of exactly what they want and how to get it. Interestingly, the most recent Resident Evil movie, created as a CG followup to Resident Evil 4, is closer to what you get in Patient Zero. I like this turn in zombie works, and I would like it to continue. Patient Zero is highly recommended for zombie fans.